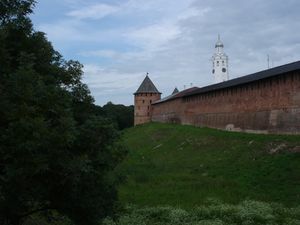 Novgorod (Russian: Великий Новгород Velikii Novgorod) is one of the oldest cities in Russia. It was first mentioned in the manuscripts as early as 859. The city of Novgorod The Great (Novgorod Veliky) is located between Moscow (530km) and Saint Petersburg (108 km). Its population is estimated at 230,000 people. 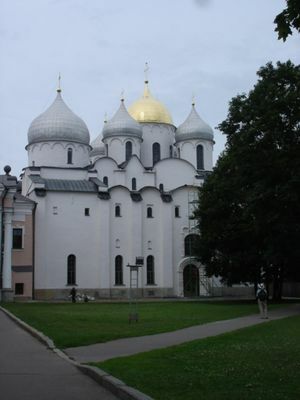 Novgorod is inscribed on the World Heritage List. 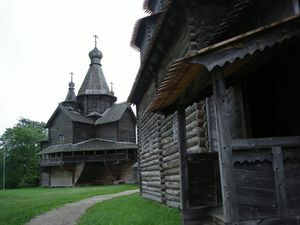 Novgorod was first mentioned in manuscripts as early as 859. 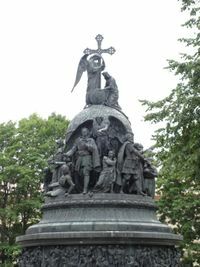 Together with Kiev, Novgorod was a very important cultural, social, and economical centre in Rus, and was the capital of one of the first European democracies, the Novgorod Republic. Novgorod Airport (IATA code: NVR) is not operational. It was a busy airport during the time of the USSR. 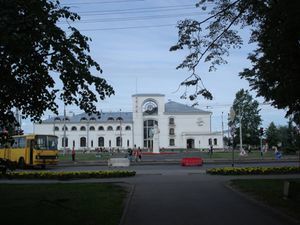 The Novgorod-Na-Volhove train station is located 1.5km west of the city center, the river, and the Detinets (Kremlin). Russian Railways operates trains between the Novgorod-Na-Volhove train station and Saint Petersburg's Moskovskiy Vokzal station (3 hours, early morning and late evening, ~400 руб) as well as Moscow's Leningradskii Vokzal station (8 hours, overnight, 800+ руб). The trains to/from Saint Petersburg are all seated and can be uncomfortable, although there is a lot of leg room. The overnight trains to/from Moscow feature soft berths and compartments for an additional charge. All trains and elektrichkas make a brief stop in Chudovo, where you can get out of the train and use a very unpleasantly dirty bathroom. Left luggage services are available at the Novgorod-Na-Volhove train station. The bus station in Novgorod is located across the street from the train station. Several buses run daily from Saint Petersburg's Main Bus Terminal to Novgorod (several daily, 4 hours, ~200 руб). Buses to Moscow operate only during the summer, but the trip is long and inconvenient. Buses also operate to Tver, Pskov, Riga, and other cities in the Novgorod region. Novgorod has both bus and trolleybus systems. Running approximately every 5 minutes, buses and trolleybuses will get you to every part of the city. Bus & trolleybus route maps and timetables are available online in Russian. An trip costs 22 Rubles (Summer 2016). Novgorod is a walking-friendly city, and if you like long walks, everything in the city is within walking distance. The advantage is also that you have a chance to see the beautiful architecture of the city. Bicycles are a perfect way to get around Novgorod. Bicycle and rollerblade rental are available at the "Shooting Club" on the Main Alley of the Kremlin Park. Phone: +7 921 731 74 32. Taxis are cheap and plentiful. You can try water taxis or a boat trip. Novgorod from the river looks pretty amazing, especially the Kremlin. Boats leave from the bridge outside the Kremlin, with the first departing at 11 am. They offer a 2 and 1 hour tour (500 and 400 Rubles). Great way to start the day. There are different activities and services available at the Volchov Most River Complex - you can rent a boat or catamaran, play badminton or Russian game "Gorodki" and even swim in a swimming pool. In winter you can try hockey or rent cross-country ski. If you have a bit more time, you can go to Ilmen (a village just a few kilometres away from Novgorod) to the rope park. It consists of 2 routes (4 and 11 meteres high) of different complexity. A great activity for kids but not only:). Souvenirs, particularly wooden handicrafts and birch-bark paintings, can be found at many locations, including the souvenir market on Sennaya Square (to one's right as one faces the Kremlin from Sofiyskaya Square and the Lenin Statue). Honey mead is a local favorite.